Our parents have tried very hard to keep things like toys and games from becoming the center of our lives. We don’t have a big Christmas, and we don’t get birthday presents; instead, we go do something fun. This is generally a good practice, but it breaks down when we do get new things. Occasionally, we have a Stuff Day. It doesn’t come every year and it doesn’t come on a specific day, but when it does, we’ll be excitedly cutting packing tape and popping bubble wrap. We made a big Amazon order recently because here in San Andres we can have things shipped to us duty-free in a container. The minimum cost is $80, which might seem expensive, but it’s measured in cubic feet, and when you order a bunch of stuff, it’s not that much. It only costs $130 to ship 40 cubic feet of cargo, which is obviously more than we were getting. All of our boxes but one made it onto the ship, and then we just had to wait for it come. It took four days to get to San Andres from Miami, all of which were filled with anticipation and speculation on our part. 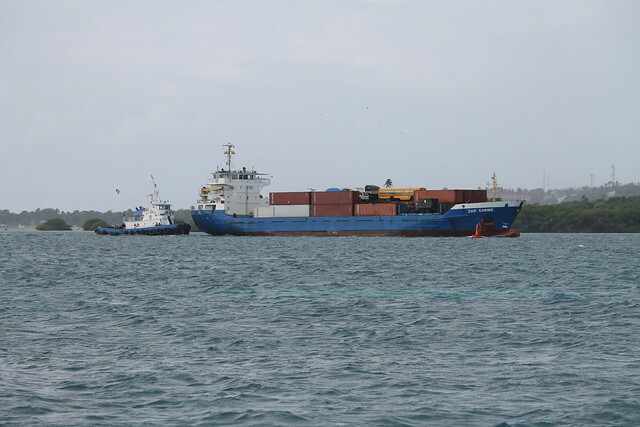 On the day of its arrival, we all watched, trying and failing to suppress grins and evil laughs, as the Jan Caribe, the ship bearing our goods, came into the channel. This is what I’m talking about: we’re all excited and giddy about some stuff on a container ship. 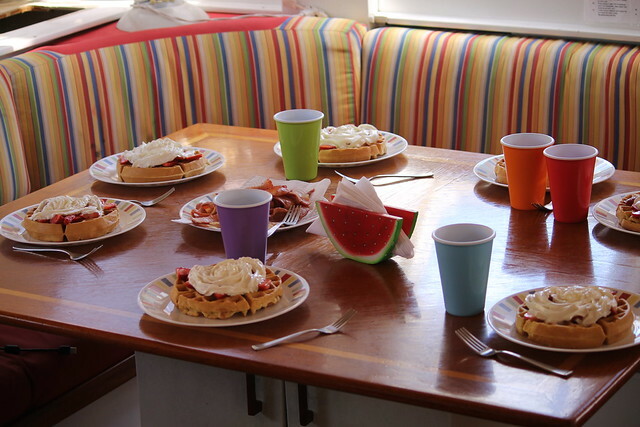 All right, it wasn’t just “some stuff,” that container held a waffle-maker, a five-by-eight-foot inflatable platform, four Wii controllers (we already had a Wii that someone had given us), and a 32” television (among other things like boat parts of course). The next day, we collected it all and got it onto the boat. Once it was all inside, the packages took up our entire living room space! Then we started unpacking. It took us an hour to open all the boxes, unpack them, and stow the loot. We got dock lines, a shore-power cord, orange cleaner, mail, a wind instrument, etc. ; it was the biggest pile of new stuff we’ve ever had! 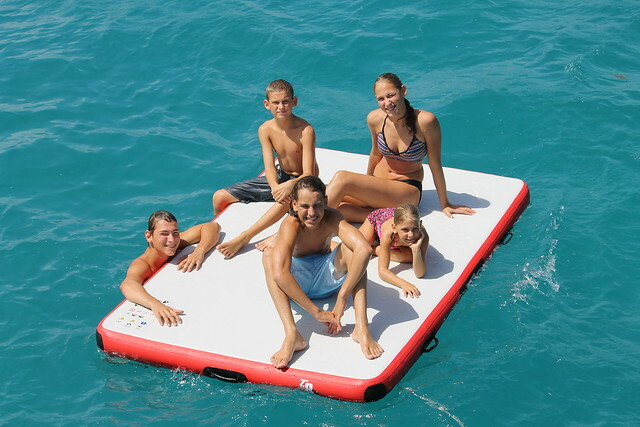 We inflated our new raft and played on it. We made waffles the next morning with our new waffle maker. We even got to play Mariokart on the new TV! It just shows that despite our best intentions not to become materialistic, there is no denying that new stuff makes us happy, at least for a short time.